Season wagyu beef cheek with salt and pepper. Pan-sear with olive oil till surface is brown. Pour 750ml of red wine, chopped vegetables, lotus root (whole), veal stock and beef cheek. Bring to boil. Once boiled, cover pot. Set oven at 66°C. Slow braise mixture for 36 hours. 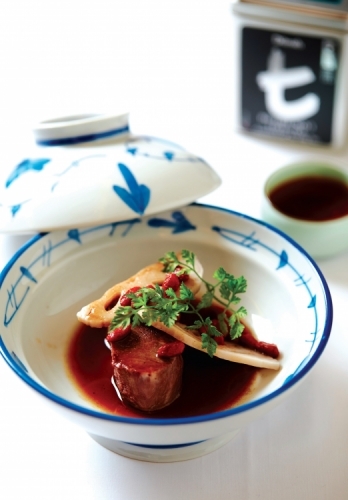 Once cooked, take out both lotus root and beef cheek, leave to cool, slice beef cheek and lotus root. Blend all cooked vegetables, strain add in wolfberries to reduction. To serve, drizzle sauce over beef cheek and lotus root. Plate.